Stanford led the tournament all three rounds clinching the U.S. Intercollegiate title by six strokes at the Stanford Golf Course. The Cardinal (272-271-274) finished at 23-under-par 817 with four players finishing in the top six of the leaderboard. Patrick Rodgers finished second at eight-under-par 202 and Andrew Yun, going five under in the final round, was one stroke behind at 203 for third. Cameron Wilson shot a pair of 68s and a 69 for fifth at 205, and David Boote (68-69-70) was two strokes behind at 207, tying for sixth. Steve Kearney, who competed as an individual, finished eighth at 208 after shooting a 65 (-5) to match his career-best round. In February at the Amer Ari Invitational, Kearney finished fourth after shooting a final round 67 (-5). In both these low rounds, he made seven birdies. Yun, who also shot a 65 today, was tied for seventh heading into the final round after shooting 70 on the opening day and going two under for 68 in the second round. The senior sneaked into third with six birdies. Rodgers, who tied for first heading into the final day, fell three strokes behind TCU’s Paul Barjon who won the tournament at 11-under-par 199. Barjon had a bogey-free round and made birdies on the first, seventh and 16th holes. Rodgers, a sophomore, remained tied after a birdie on the ninth but bogeys on the 11th and 14th sealed his runner-up finish. Stanford last won the U.S. Intercollegiate team and individual title in 2007. Today’s win becomes the Cardinal’s 13th team victory in this tournament. Philip Rowe, Stanford’s Enlight Foundation Assistant Coach and co-tournament director, won the U.S. Intercollegiate individual title in 2002. This time he was on the other side of the team chemistry as a coach. Rounding out the official lineup was sophomore Patrick Grimes (74-71-75) who tied for 62nd at 220. The unofficial Stanford White (287-287-280) lineup finished even at 854 tying for ninth. Kearney led the individuals, followed by freshman Dominick Francks (71-72-70) who tied for 30th at 213. Junior Shane Lebow (72-76-70) carded a 218 to tie for 53rd, while redshirt senior Wilson Bowen (71-74-75) tied for 62nd at 220. Redshirt junior Andre DeDecker (73-72-77) finished at 222, tying for 76th. Freshman Keegan English (76-76-74), who competed as an individual, tied for 86th at 226. The Cardinal competes next at the Western Intercollegiate at Santa Cruz, Calif. on April 13-14. STANFORD, Calif. - Stanford remains in first at 17-under-par 543, after being the only team to shoot under par in the second round of the U.S. Intercollegiate at Stanford Golf Course. The Cardinal (272-271) leads the tournament by 11 strokes heading into the final round with four players in the top 10 of the leaderboard. "The first six holes are the most difficult and we got there even par as a team," said The Knowles Family Director of Golf Conrad Ray. "It was one of the first rounds all year that all five guys played decently well. There was a good vibe on the course and that's what you really need to do to win." bogeys and, again, went four under. The freshman (66-66) tied for first at 132 with TCU's Paul Barjon who led the second round through the front nine after six early birdies. Rodgers birdied the third, bogeyed the fifth and had back-to-back birdies on the seventh and eighth holes, but still trailed Barjon by two strokes. With a birdie on the 13th and 15th, he climbed back up to the top of the leaderboard. 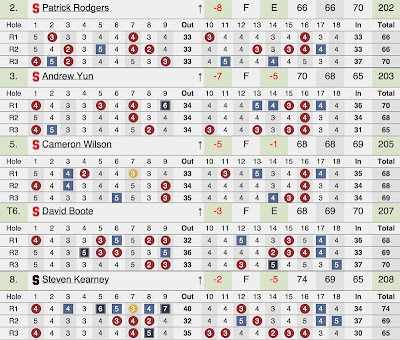 A birdie on the 16th looked to break the tie for first but a bogey on the 17th left Rodgers with Barjon. With a pair of 68s, Cameron Wilson is tied for third at 136. He started the second round with a birdie on the first hole and closely followed that with a bogey on the third. The junior managed to go two under with a birdie on the ninth and the 16th. David Boote, who opened the tournament at 68 along with Wilson, carded a 69 to tie for fifth. He managed to balance out a double bogey on the fourth with consecutive birdies on the fifth and sixth holes. The freshman then bogeyed the ninth but came back with three consecutive birdies on the 14th, 15th and 16th, closing the round with a bogey on the 17th to still remain under par. Close behind was Andrew Yun (70-68) who is tied for seventh at 138. The senior birdied the seventh and the 16th. He pared the rest. "I hit a lot of three woods out there," said Yun about his bogey-free round. "I had a much more conservative game plan because my driver put me in a couple of bad spots during the first day, so I decided to leave it in the bag for most of the round." "Coach Ray and I worked on my swing after the first round. I inputted some of the tips he gave me on the range yesterday and I told myself to make confident swings." Closing in on the top five of the team leaderboard is TCU (274-280-554) in second, followed by St Mary's (273-286) and San Francisco (275-284) who are tied for third, while Oregon (282-283) checks in at fifth. Despite the lead, before the final round, Ray will tell his team to "not worry about the scores so much. Focus on the course, not the results, and control the things you have control over." 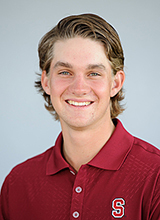 Rounding out Stanford's official lineup was sophomore Patrick Grimes (74-71) who tied for 58th at 145. The unofficial Stanford White lineup made up of individual competitors remained at 13th at 574 after shooting a pair of 287s. Leading the individuals were freshman Dominick Francks (71-72) and senior Steve Kearney (74-69) who both tied for 33rd at 143. Kearney made four birdies to finish an under-par round. Redshirt senior Wilson Bowen (71-74) and redshirt junior Andre DeDecker (73-72) tied for 58th at 145, while junior Shane Lebow (72-76) recorded a 148 to tie for 71st. With a pair of 76s freshman Keegan English, who competed as an individual, tied for 87th at 152. The final round resumes on Saturday at 8 a.m. (PT). Tee times off the first and 10th holes. Live scoring is on Golf GameBook. "You can get a lot of momentum if you make some putts out here," Yun said. "So the putts are going to have to drop tomorrow." 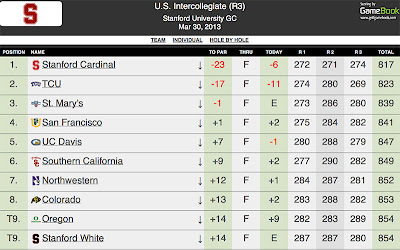 stroke on Thursday in the opening round of the U.S. Intercollegiate at Stanford Golf Course. Patrick Rodgers, who is tied at first with six other players, led the Cardinal at four-under-par 66. The freshman made four birdies on the second, seventh, 10th and 16th holes and finished with no bogies --- see his scorecard below (click to enlarge). "Getting off to a good start was big," said Rodgers who used 31 putts and hit 16 greens and eight fairways. "To hit it to a tap in on 10 was great. It's always nice to have the comfort of being under par and letting the round come to you as opposed to trying to force it." "I stayed patient and composed all day, making good decisions to stay bogey-free." Under sunny ideal conditions and a light breeze, six teams shot under par, all of whom are a stroke from each other. Stanford was even through the front nine and crept up to the top of the leaderboard heading into the round. St. Mary's shot a 273 for second, while TCU checked in at third with 274. Close behind was San Francisco at 275 for fourth. San Jose State, who led the tournament through the first nine holes, scored 276 for fifth, as USC took sixth at 277. "When it's that tight, that means you have to do all the easy stuff well," said The Knowles Family Director of Golf Conrad Ray. "Avoid three putts. Hit the ball in the fairway. Stay away from the big numbers." "There isn't a lot of rough. There might be a little separation in the next two days with wind tomorrow and rain on Saturday." Both Cameron Wilson and David Boote opened with a 68, finding momentum in the back nine and tying for 13th. Boote--who teed off on the 10th hole with all the Cardinal players--headed into the round at one over. The freshman turned that around with a birdie on the first hole. He pared his next three holes and made birdie on the fifth. A bogey and par quickly followed, but Boote managed to birdie his final two holes. "This is the first event my family has watched me play in college," said Boote who hails from Surrey, England. "The plan for tomorrow is to keep playing well, staying in control of my ball and managing my mind." For Wilson, he was at par going into the last nine holes. "My front nine was sort of a struggle," Wilson said. "I stayed pretty patient though and didn't get too up or down. I didn't start too well on the back nine, got a bogey on three but, again, stayed patient and had a long putt on four for birdie and an eagle on seven." Andrew Yun carded a 70 to tie for 26th, after five birdies--three of which were in the back nine. The senior was two under going into the final hole but he double bogeyed the ninth to settle for par. Rounding out the five was sophomore Patrick Grimes who tied for 66th at 74. "We played solid on the front," Ray said. "The west wind made some of the holes, such as the second and seventh, shorter than normal. The guys had a nice finish, other than Andrew, but there is a lot of golf left." The rest of the six players on the Stanford men's team played as individuals. Five were unofficially grouped as the Stanford White team (as opposed to the official lineup which was dubbed Stanford Cardinal). On the Stanford White lineup was senior Steve Kearney, junior Shane Lebow, redshirt junior Andre DeDecker, freshmanDominick Francks and redshirt senior Wilson Bowen. Stanford White scored 287 for 13th, ahead of five other schools. Francks and Bowen led Stanford White with a pair of 71s, tying for 31st. Tied at 49th was Lebow with 72. DeDecker recorded a 73 to tie for 61st, while Kearney shot a 74 to tie for 66th. Freshman Keegan English, who also competed as an individual, carded a 76 to tie for 83rd. The second round resumes on Friday at 8 a.m. (PT). Tee times off the first and 10th holes. Live scoring is on Golf GameBook. "Our guys traditionally have been better front-runners than coming from behind," Ray said. "They're good about managing their game and playing in confidence. We have been in the middle of the pack in most of the tournaments so this is good for us." Pre-Tournament Background by gostanford.com --- All 11 members of the Stanford golf team will be competing in the US Intercollegiate. STANFORD, Calif. - No. 10 Stanford, up three spots in the Golfweek rankings, hosts the 45th annual U.S. Intercollegiate on Thursday at the Stanford Golf Course. The Cardinal is joined by No. 7 USC and No. 8 TCU, headlining a field that also includes Pac-12 rivals Oregon and Colorado. Rounding out the 17-team field are Saint Mary's, Northwestern, San Diego State, Iowa, San Francisco, UC Davis, Lamar, San Jose State, Pepperdine, Minnesota, Hawaii-Hilo and Nevada. "We're excited about the field," said The Knowles Family Director of Golf Conrad Ray. "USC and TCU are here and both are really good teams that have played well on our home course. I think it'll be a good test for our guys." This 54-hole event consists of three rounds, from March 28-30. Play will begin at 8 a.m. (PT) each day with tee times off the first and 10th holes. Ray will start a lineup featuring sophomore Patrick Rodgers, junior Cameron Wilson, senior Andrew Yun, sophomore Patrick Grimes and freshman David Boote. Boote qualified the lowest and takes the fifth spot according to Ray's strategy: "Lead off with strength and finish with strength." Grimes, who has not been in the starting lineup since the Pac-12 Preview in the fall, replaces senior Steve Kearney. "Grimes kind of had that spot for us all last spring and he's been working hard to get that spot back," Ray said. "He knows the course well and he's grown up around the area. In qualifying, he ended up shooting one stroke better than Kearney." Kearney, who started in three tournaments this spring, will compete as an individual, along with junior Shane Lebow, redshirt junior Andre DeDecker, freshman Dominick Francks, redshirt senior Wilson Bowen and freshman Keegan English. "Each guy does a good job of knowing what they need to do to prepare for a tournament," Ray said. "A number of the players were able to get home and see their swing coaches, spend some time with their families and recharge their batteries after a busy finals week." Stanford has had 12 team victories and 13 individual titles at the U.S. Intercollegiate, the most of any other school in both categories. The Cardinal captured the first team and individual titles in 1968 during the inaugural year of the tournament. Stanford alumni who have won the U.S. Intercollegiate have been Sandy Adelman (1968), Gary Vanier (1970), Tom Watson (1971), Conrad Nilmeier (1973), Dave Baskins (1974), Mike Peck (1976), Mike Milliken (1990), Casey Martin (1995), Joel Kriebel (1996 & 1997), Philip Rowe (2002) and Rob Grube (2006 & 2007). The Cardinal holds the longest U.S. Intercollegiate team winning streak at six years from 1970-1975. Live scoring will be available at Golf Game Book. Fans can download the app on their smartphones and follow hole-by-hole scoring, view pictures and leave comments in a newsfeed. Stanford struggled on its final round with a 12-over 300 team total and ended up 5th in the Southern Highlands Collegiate Masters played in Las Vegas after standing in 2nd place after rounds 1 & 2. The Cardinal's three round total (286-290-300 876) was 20 strokes behind the winning Cal team. Although the final round was a disappointment, the Cardinal still finished in front of 6 teams ranked ahead of them. The highlight of the tournament for Stanford was Patrick Rodgers winning his 3rd tournament of the year in a 4-man playoff (66-73-73 212). He birdied his final hole to get into a playoff and birdied the first playoff hole to win. Video of Patrick's final hole pitch | Video of Patrick's final hole birdie putt | Video of Patrick's winning playoff birdie. Cal won its 8th team title in by 13 strokes with an 856, 8-under par total that featured steady play by all five players who individually shot between 212 and 218. For Stanford, Cameron Wilson had an excellent tournament finishing 5th on rounds of 71-71-73 215, 3 shots behind Patrick's winning total. Andrew Yun tied for 31st with 73-74-76 223, David Boote tied for 48th with 76-72-78 226 and Steven Kearney ended at 237 with 83-75-79. 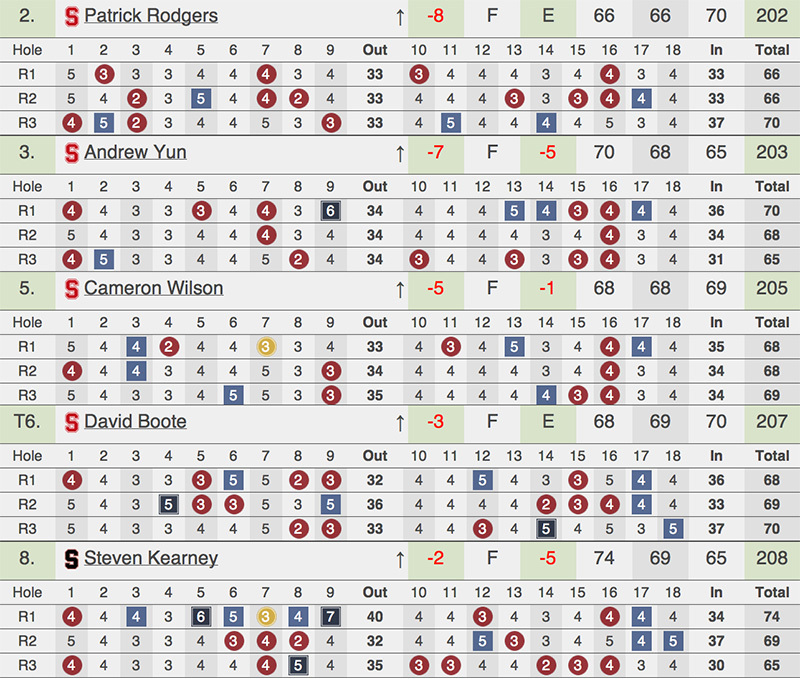 Stanford's final round scorecards are shown below. Of note, both Patrick Rodgers and Cameron Wilson started their rounds with double bogies but still finished strongly. Andrew Yun started with a triple bogie and played 1 over thereafter. Stanford trails in second at even-par 576 on Saturday in the second round of the Southern Highlands Collegiate Masters. Tournament front-runner Patrick Rodgers shot one-over-par 73 after firing three early birdies over the front nine. With a 66 in the opening round, the sophomore heads into the last day at five under. "The wind on the front nine made a few of the holes accessible," said Rodgers who has a two-stroke lead. "I tried to fight hard on the back but it was playing tough. I just made a few bogeys with quality shots that ended up in the wrong spots. I feel comfortable with my game, and if I can make good decisions tomorrow hopefully I can lead the comeback." California (285-280), the only team to shoot under par today, went eight under for the lead at 565, 11 strokes ahead of the Cardinal. There was a battle of the Bay at the Southern Highlands Golf Club. 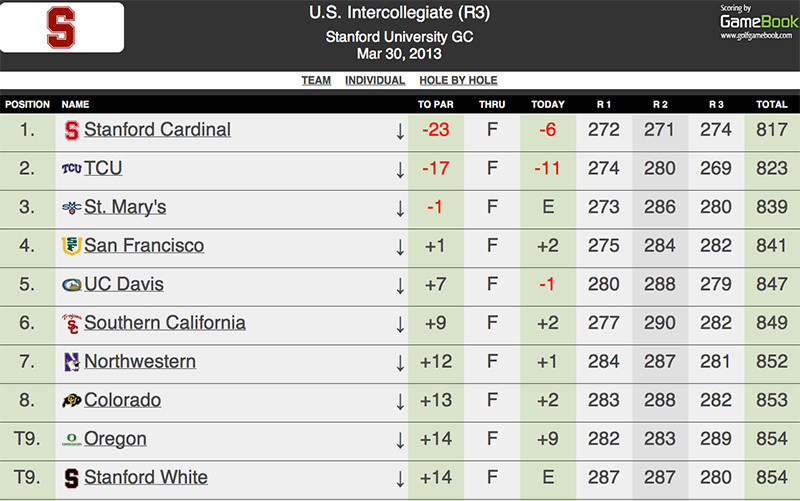 Over the front nine, Stanford managed to lead the tournament a stroke ahead of California. Through the back, however, three California players shot under. The Cardinal (286-290) still produced a solid round at two over for the third low round of the day. "We're up for tomorrow's competition and on this golf course 11 shots is very attainable," said The Knowles Family Director of Golf Conrad Ray. "To play the final pairing with two great teams is a neat opportunity for our guys and they'll rise to the challenge. They handled themselves well today and had a little bit of a slow finish on a course where the last few holes are pivotal." Cameron Wilson led the team at 71 after making four consecutive birdies over the front nine. The junior is tied for fourth at 142 after a 71 in the opening round. "I got some comfortable yardages and hit some precise short irons on holes six through nine," said Wilson. "All of my birdie putts were inside 10 feet." Senior Andrew Yun (73-74) tied for 23rd at 147, while freshman David Boote (76-72) was not too far behind at 148, tying for 28th. Steve Kearney (83-75), a senior, finished 77th at 158. The final round resumes on Sunday at 8 a.m. Stanford, paired with California and Alabama, tees off at 9:39 a.m. with nine minutes apart between groups. "The weather should be better tomorrow, but hole locations will probably be challenging," said Wilson. "My game plan is to be very patient and accepting of all the breaks, good or bad." Stanford is in second place at two-under-par 286, just one stroke behind California, on Friday in the first round of the Southern Highlands Collegiate Masters. Sophomore Patrick Rodgers led the tournament with a six-under-par 66 after opening with two consecutive birdies and firing three more to end the front nine at five under. Two more birdies and a bogey on the back nine left Rodgers with a two-stroke lead. "On the front nine I just tried to take what the golf course gave me," said Rodgers who hit 12 fairways and had 26 putts. "The wind laid down a bit and the greens were receptive so the course offered a few early birdies. I hit a lot of quality shots, controlled the ball well and converted the putts to get it going early." Under cold, windy, rainy conditions, where some sleet covered the ground and the tournament had to call a rain delay, only Stanford and California shot under par. "We had a great team contribution all the way around and I'm confident Steve Kearney will be in there for us in the next few days," said The Knowles Family Director of Golf Conrad Ray. "We know there's a lot of golf left and we're going to continue to control the things we can control, picking good clubs and having good strategy on the course." Another Cardinal front-runner was Cameron Wilson who shot a 71 to tie for seventh. The junior birdied the second, seventh, 10th and 16th holes for a solid performance. Senior Andrew Yun tied for 19th at 73 after two early bogeys and a birdie over the front nine. Then he overcame a late bogey by making a birdie on his last hole for one over. Rounding out the field was freshman David Boote who tied for 51st at 76 and Kearney at 83, tying for 78th. Boote, who was six under, managed to make an eagle on his last hole to finish four under. The second round resumes on Saturday at 8 a.m. Tee times off the first and 10th holes. "It is always nice to be in the lead individually but we are one behind in the team event," said Rodgers. "Team golf is nice because it can really clean your slate individually and you can go out and play aggressively in an effort to shoot the best team score possible." LAS VEGAS, Nev. - Stanford, up one spot to No. 13 (Golfweek), competes on Friday at the Southern Highlands Collegiate Masters, where all the teams rank in the top 40 and the majority of which are in the top 10. The Cardinal is joined by top ranked California, No. 2 Texas, No. 3 Alabama, No. 5 New Mexico, No. 6 UCLA, No. 7 USC, No. 8 Duke and No. 10 Florida. Rounding out the 15-team field are No. 11 Georgia, No. 12 Georgia Tech, No. 16 Okalahoma State, No. 25 Texas A&M, No. 26 Oklahoma and No. 40 UNLV. "The course and field at the Southern Highlands Collegiate Masters are two of the strongest we will see all year," said The Knowles Family Director of Golf Conrad Ray. "You need to have very good ball control on the course and typically even par is a very good score both individually and as a team. The event is a very good litmus test on where we are with things as we begin to prepare for the spring run toward NCAAs." This 54-hole event consists of three rounds, from March 8-10, on the Southern Highlands Golf Club. Play will begin at 8 a.m. each day with tee times off the first and 10th holes. Live scoring will be available on GolfStat.com. "Southern Highlands is a demanding golf course that tests all facets of the game," said sophomore Patrick Rodgers. "The greens are fast and firm, the golf course is long and the rough is difficult. As a team we need to be sharp mentally." After a fifth-place finish at the Prestige at PGA West and a seventh-place finish at the Amer Ari Invitational, Ray starts the same five players in a shuffled order. The lineup is Rodgers, freshman David Boote, senior Steve Kearney, junior Cameron Wilsonand senior Andrew Yun. "When we play in events that use the format of tee time starts off the first and tenth holes, there is some advantage to lead off with strength and finish with strength," said Ray. "We believe Andrew is primed to have another great event and we expect him to get out of the gates quickly. Patrick has been very steady and likes being the last guy on the course with a task at hand. Steve has been very steady for us as well the last few events, thus his spot in the middle of the lineup supports this effort." Yun returns to competition after leading the team, along with Wilson, at a tied seventh-place finish at the Prestige. "I feel like my game is really solid and I `m capable of contending for the title," said Yun. "To get to that next level, I will need to be more consistent. I have been making enough birdies, but the bogeys need to be reduced. I have been making small but significant errors that cost me one to two shots a round, which equates to three to six shots a tournament. So if I can just marginalize the errors, maybe I can head into the back nine Sunday in contention for the win." "The course tempts you to take on risk many times throughout the round," said Rodgers. "We need to establish a game plan for the golf course and stay committed to it throughout the event."